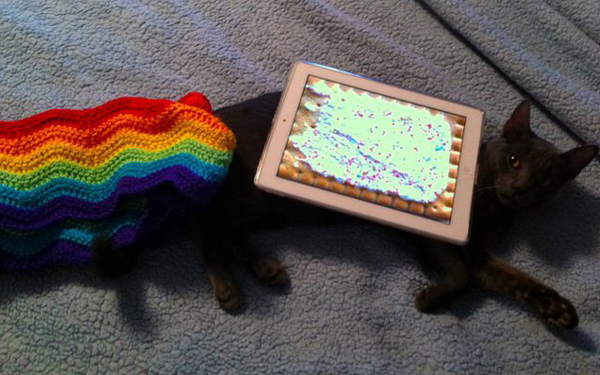 Marty, the famous cat who inspired the great Nyan Cat meme, unfortunately passed away last week, causing lots of sad faces for fans of cats, memes and the crazy web. Luckily the meme Nyan Cat isn’t real, so he can live in our hearts and on our screens pooping a never-ending rainbow for eternity. Or until the internet stops, whichever comes first. Glad to see 6 reactions tho. Also wish I'd proofread my copy. Am doing so now! Comments do pile up on Nyan scarf tho. Meant “Rainbow Bridge” of course, & “but”.